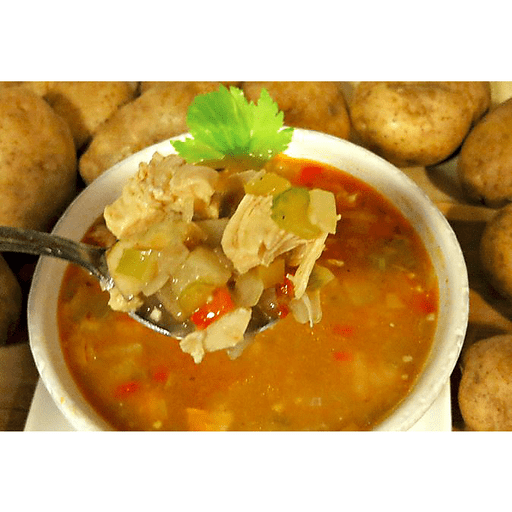 A quick-cooking and filling Potato & Chicken Gumbo is the perfect soup to warm up with. 1. Melt the butter in a large soup pot. Add flour to melted butter, whisking to combine well. Let cook for 2 minutes or until a rich golden brown. Carefully add chicken broth and water, whisking to combine. Bring to a boil. Add shredded potato and let simmer for 12 minutes. Add onion, peppers, celery, garlic and chicken. 1. Stir in Creole seasoning and sautéed potatoes. Taste and adjust seasoning, if desired. Continue to cook for another 10 minutes, or until the vegetables are cooked, but still firm. Serve. Calories 280, Total Fat 7g (Saturated 2.5g, Trans 0g), Cholesterol 65mg, Sodium 490mg, Total Carbohydrate 26g (Dietary Fiber 2g, Sugars 1g), Protein 28g, Vitamin A 70%, Vitamin C 40%, Calcium 10%, Iron 10% *Nutritional values are an approximation. Actual nutritional values may vary due to preparation techniques, variations related to suppliers, regional and seasonal differences, or rounding.